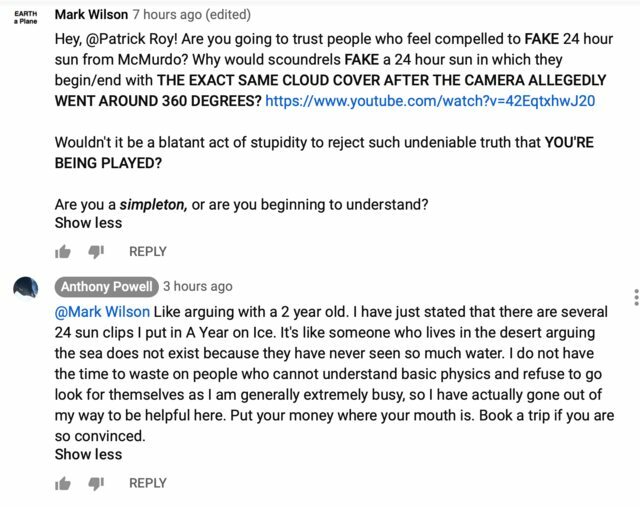 Thanks for these Arctic Sun videos. That hand't crossed my mind yet. The midnight sun seems to be an absolute proof that the Earth isn't a spinning ball.. 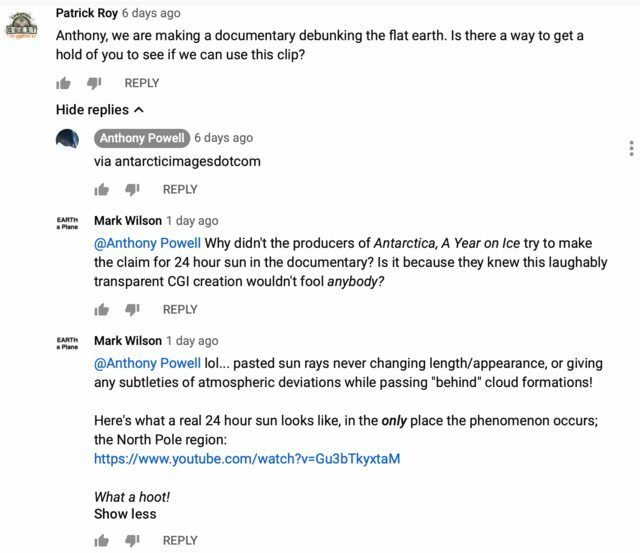 Thanks for debunking those 'midnight sun in Antartica' videos.. I'm new here and I've gone through atleast 80% of Eric's work, which has made me reconsider not just my beliefs on the place we live on but also my stance on religion and ultimate reality... Thanks for everything Eric Dubay! It's always been about excepting an Authority and the Fiction they spin. ...i realy need an answer... i had seen the flat earth society answers but it makes no scence" We do not use gravitational laws for anything gravity does not exist. There is not a single airplane that uses laws of gravity in its design or flight. You've registered on this forum with the name "Wisdom", and can't be bothered to read this forum for simple answers to your many questions. 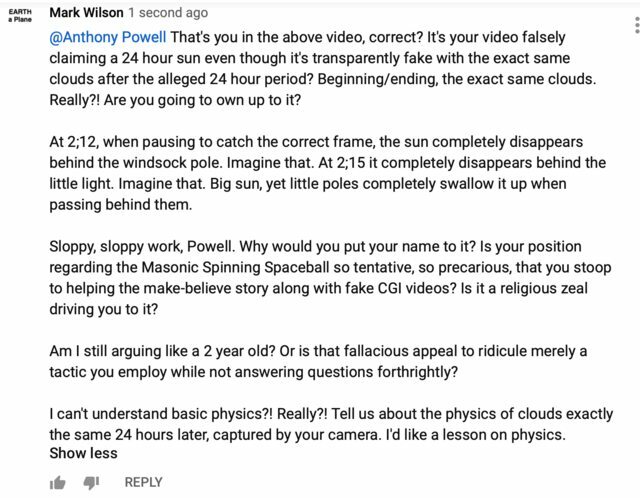 Here we find you Off Topic and asking about the Theory of Gravity. There is no God Force pulling on you, if there is, you be sure to tell me where that mean old Priest touched you. All unsupported objects heavier than air have a natural tendency to fall by their own weight. Air-filled balloon falls slower than balloon without Air. WHY? The air filled balloon gains air resistance slowing it's rate of descent; in our natural system all objects fall or rise based on their density. Through air-resistance (drag), all objects of differing size and density fall at different rates until they reach Terminal Velocity, at which point streamlining the object can be used to obtain more speed. In order to have the most daylight the better months are January and February. Although December could be good option too. 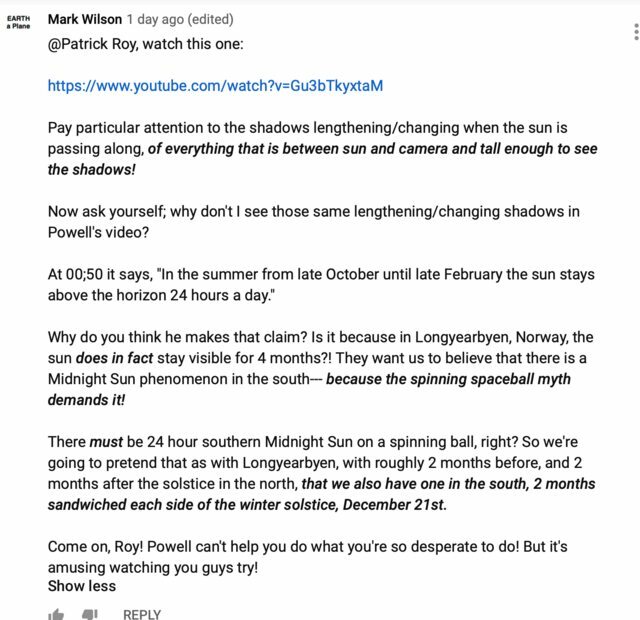 Of course this isn’t the ultimate proof for the non-existing midnight sun in Antarctica, but a travel agency would have known the exact period if something like this occurs. about the best date for experiencing the 24-hour daylight period. The Sun over the flat Earth moves above the Tropic of Capricorn during the Months (December, January, February), which would provide "the most daylight months". At no time did the Travel Agent claim Midnight Sun. Schpankme wrote: At no time did the Travel Agent claim Midnight Sun. That was indeed my point Schpankme. The agent would have mentioned the midnight sun if it existed, but all they could give me was the period of the most daylight. The only reason for this article's existence is to bolster the myth that "at least there's 24 hours of sunlight most of the time." 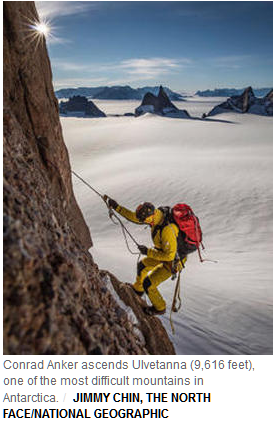 Thus the reason for the title 'North Face Climbers Re-Enforce the Lie' and the selected parts of the story. Ya for sure the flat earth society nonsense about the plane constantly moving up is ridiculous. Which engineering studies need gravity that wouldn't work with weight buoyancy and density? I haven't looked in to this specifically so I'm curious as well. Decided to make a short timelapse so we can compare it to the 24h timelapse seen on page 1. Not as long, best I could do on one day. I took photos of the sun over the course of about 6 hours. Here are two GIFs of the photos. Ignore the time stamps, the time was set incorrectly! It would be great if somebody could make a longer one. There are too much clouds at this time of year here. Will try again at some point. I´m new here writing from Iceland where we experience 24h daylight for some weeks every summer. 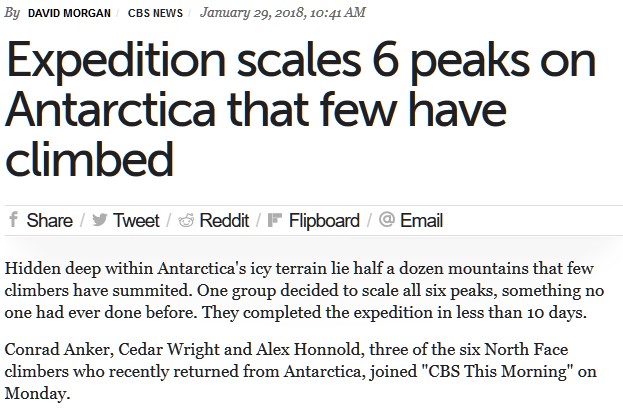 I have no doubts the earth is flat but have problem with Antarctica. 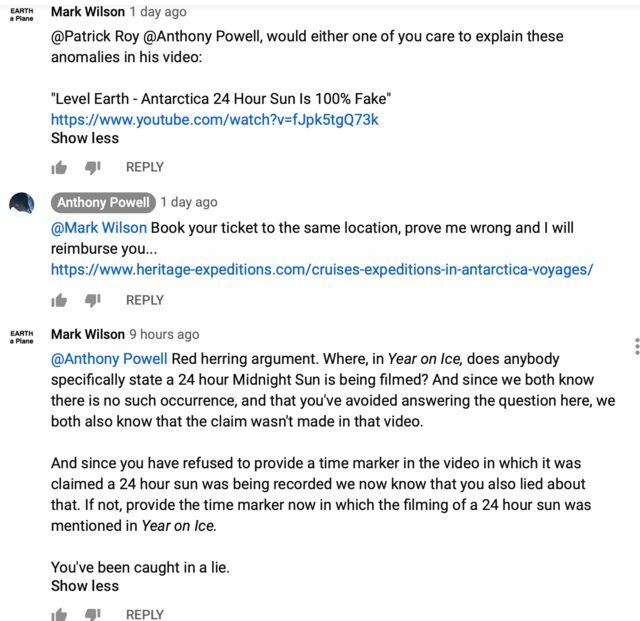 I was watching Jeremias video: There is no Midnight Summer in Antarctica, where he proofs that web cam videos are clearly edited to show 24h daylight in Antarctica. 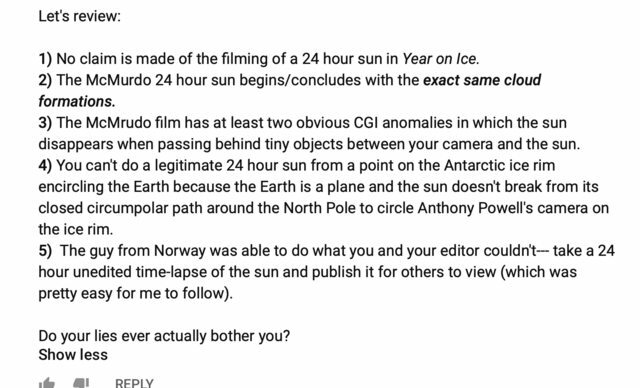 Then I went to the comment section and found some people saying they have been to Antarctica and experienced 24h daylight. Are those people trolls? Freemasons? Lying scums? Sounds very far fetched, but is it possible to fake 24h daylight in Antarctica? Rob Skiba talks about NASA “fake sun patent”. 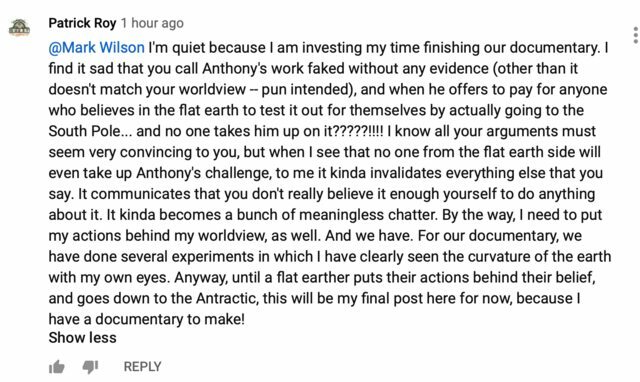 Jeremias ends his video showing some mirrors on Antarctica and doesn´t rule out there could be 24h daylight on Antarctica allthough there is no 24h sun!!! Here in Iceland we have this woman, Vilborg, who went to the “south pole” some years ago. Did she experience dark night and decided not to tell anyone (well maybe her dog) or is she a freemason, part of the conspiracy? 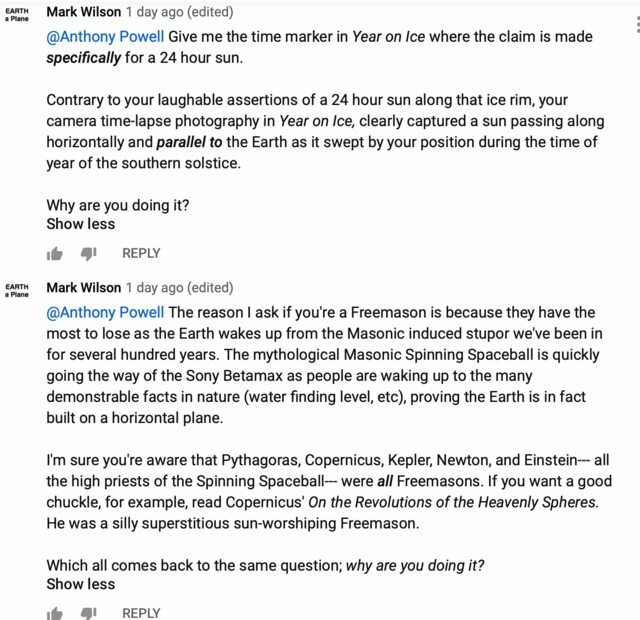 Every person who has gone to the “south pole” must then be part of this conspiracy and all those 1200 people who I saw in a comment section are said to dwell at McMurdo Station (Antarctica) must be part of this same conspiracy? If you had read this forum, you would have known that Jeranism is part of the "controlled opposition", he is there to put doubt in your head. 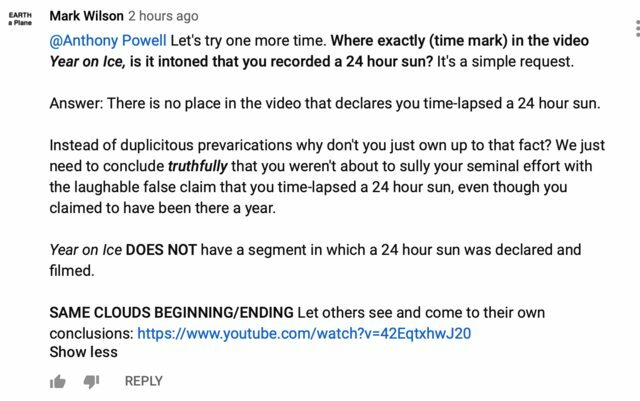 You then state, that this nobody called Jeranism comments about "24 hour Sun in Antarctic" and 1200 people write comments claiming to have seen this fictional event. On the flat Earth there is no South Pole, for Antarctica surrounds the flat Earth. No I ment I saw it in the comment section that there is a base in Antarctica where 1200 people are said to be dwelling. There is some time since I read this forum and I have forgotten Jeranism is said to be part of the controlled opposition. Still this is the only problem I have with the flat earth. People who have gone to Antarctica and say they have experienced 24h sun. They must all be lying or I wonder if they have seen that there is no 24h sun and choose not to tell. There has never been a ships captain, who explored Antarctica during the southern summer, write in their ships log that they experienced the midnight sun. 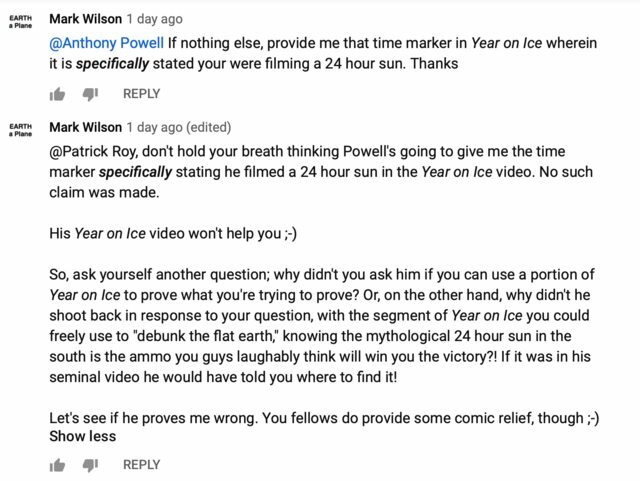 Because Anthony Powell's videos are relied upon to claim a 24 hour Midnight Sun in the south, as evidenced by the original commenter's request to use Powell's stuff for "making a documentary debunking the flat earth," I share my interaction with Powell under his video. 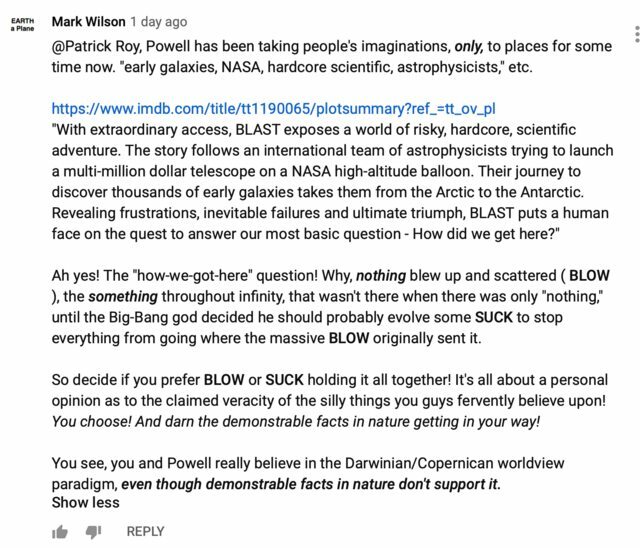 The original commenter hasn't volunteered a peep throughout the exchange between myself and Powell (he finally did, see below). 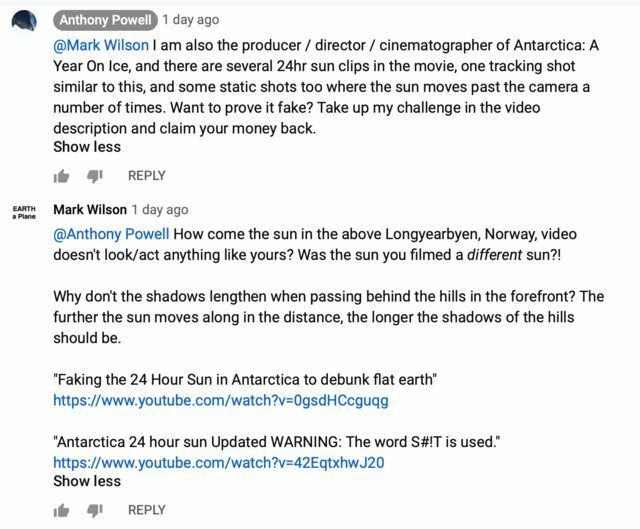 [EDIT] I watched Antarctica, Year on Ice again last night and at about 17:30 he shows a graphic claiming 4 months sun (never in the video is it intoned that we are about to watch a 24 hour time-lapse of the sun, equipment used, etc). 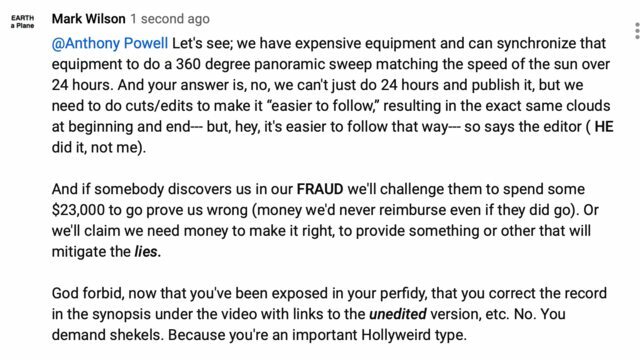 He walks away from camera (no snow on mountain behind him), starts the alleged 24 hour time-lapse (now snow on mountain), and this is the so-called 24 hours in which the beginning/ending have the exact same clouds (as discovered, I believe, by David Weiss). Exact. ONE time-lapse segment inserted and used for TWO purposes; 1) begin, 2) end his phony 24 hour southern "Midnight Sun" time-lapse. And he put his name to it with the release of the film (though he shifts blame to the editor as you will see below). 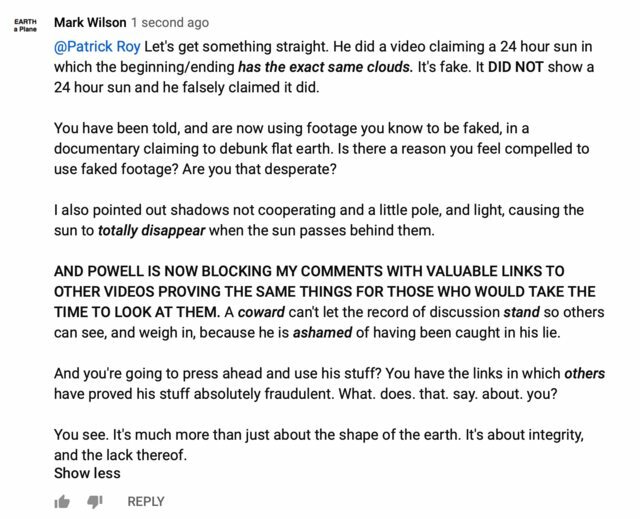 And why wouldn't a man of integrity say, "heck, no, you're not destroying my beautiful 24 hour time-lapse of the sun by falsifying it, and using the SAME beginning sequence for the ending also. That's not what my camera captured, and I demand you use the full 24 hours!"